Looking for Starbucks’ Secret Menu? Stop looking, you’ve found it. 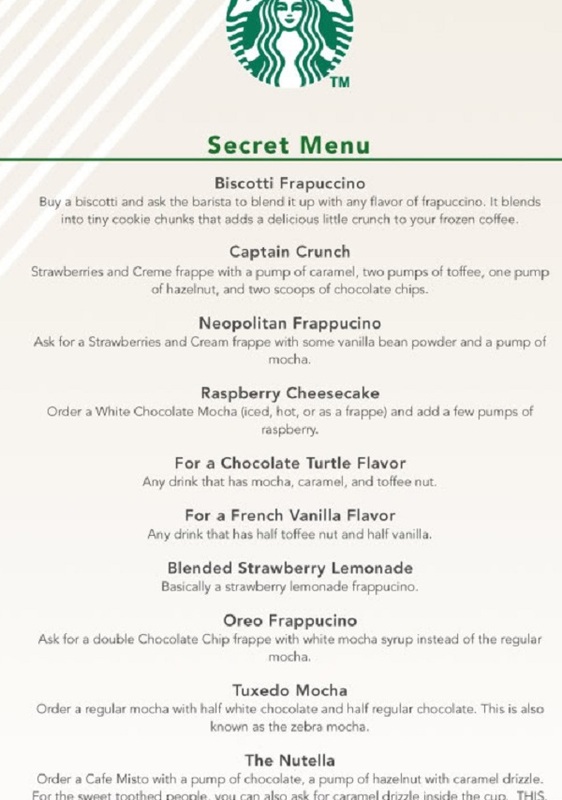 We have added the 50 most popular “secret” drinks menu items at Starbucks below. Learn how to order Starbucks Secret Menu drinks, like the Twix Frappuccino or the Cotton Candy, Nutella, Butterbeer & Oreo Frappuccinos. What is the Starbucks Secret menu? If you have arrived at this page, then you have most likely heard about the “Secret” Menu through word of mouth or through online media. In fact, the Secret Starbucks Menu is no longer very secret, but a marketing tool that Starbucks is actively promoting. The Starbucks Secret Menu drinks are drinks, that you will not find on Starbucks’ official menu. Instead, you have to ask specifically for the secret menu drink that you want, and if the barista don’t know how to make it, you will have to explain the recipe to him or her. Starbucks Secret Menu – Unofficial List of popular drink, plus a tips on how to order from the hidden menu. But do not worry, the Starbucks Secret menu is now such an integral part of the Starbucks culture, that most baristas will know the recipes for the most popular “hidden menu” drinks. At least in the USA and Canada, where this trend is most widespread. The secret menu drinks at Starbucks are not actually made up by the company’s product team, but are customized drinks made up by customers, and that have now gone “viral”. Because there are so many different combinations of ingredients, the secret menu is in effect almost infinite. You can always make up your own drink. And along the way, this allows the company to empower its customers, deepen their brand loyalty and to broaden its market appeal towards teenagers and other new customers. However, some drinks are way more popular than others, so we have added a list of the most popular secret menu drinks and frappuccinos below. The Starbucks Secret Menu – Frappuccinos. This is combination of hazelnut syrup with a Strawberries and Creme Frappuccino. Tastes like caramel dipped apples. Get it with whipped cream and cinnamon dolce topping. Basically a kids drink without caffein. Its pink and tastes like cotton candy. In summertime ask for a Valencia orange refresher blended with the vanilla bean frappuccino base. Top it with whipped cream and/or caramel. Starbucks Mint Chocolate Chip Frappuccino. A mocha frappuccino with peppermint syrup (number of pumps according to your taste) and java chips blended in! Starbucks Chocolate Chip Cookie Dough Frappuccino. If you happen to carry around any of the candies, you can drop them in when you get your order! The whipped cream on top is your choice. Tastes like cracker jacks. Just order a toffee nut frappuccino with caramel drizzle & whipped cream on top, and top with sea salt (somewhere between one and two packs depending on taste and size). With or without whipped cream on top–this nutty drink is tasty. Top with whipped cream if you’d like! Starbucks Cadbury Creme Egg Frappuccino. Whipped cream on top is optional, but recommended. Likewise for the caramel drizzle on top. If mocha cookie crumble frappuccinos are available, order one of those and add raspberry syrup (2.5 pumps for venti, 2 pumps grande, and 1.5 pumps for a tall) rather than the vanilla syrup it normally has. Starbucks Banana Chocolate Chip Frappuccino. And a whole banana blended in. Starbucks Key Lime Pie Frappuccino. Add toasted coconut flakes if those are available on top, along with whipped cream to top it off! Order a half white chocolate mocha, half regular mocha frappuccino with 2 pumps of raspberry syrup (or 3 for a venti) and top with whipped cream! Just ask for a double chocolate chip frappuccino with white chocolate mocha instead of the regular mocha syrup. You can also try this combination (with or without the chips) in non-frappuccino iced drinks, or even hot drinks! Get it with whipped cream if you’d like. Also named “Starbucks Birthday Cake Frappucino”. Add Hazelnut Syrup (1 pump tall, 1.5 pumps grande, 2 pumps venti. Or if you want something easier to order, ask for a vanilla bean frappuccino with cinnamon dolce syrup added. Also called a Tuxedo Frap. Mix white chocolate and dark chocolate! Order a mocha, hot or cold, and made with half white chocolate and half regular chocolate. Get it topped with whipped cream and mocha drizzle. Starbucks Creamy Dark Caramel Espresso Frappuccino. Order a Java Chip Frappuccino. Add two pumps of toffee nut and caramel drizzle on top. Inspired by the chocolate coated caramel cookie candy bar, this is another drink with a few variations. And add mocha drizzle on top. Tastes likemint chocolate chip icecream. Looks like a grassy green blend. Starbucks Caramel Nut Crunch Frappuccino. This one is crunchy, nutty, and packed with caramel flavor, but not as strong of a caramel punch as the caramel ribbon crunch frappuccino. With more caramel crunch pieces on top. Starbucks Secret Menu – Teas and More. A Chai latte (hot or iced) is made with a shot of espresso. Two shots makes it a “Double Dirty” or “Extra Dirty” Chai. Don’t mention this by name in the coffee house! Stir and enjoy and make sure there is no milk! A shot of espresso in regular drip coffee. Two shots of espresso in regular drip coffee. So if you’re feeling sick, give this remedy a try. Like a caramel covered snickerdoodle cookie. Ask for an iced soy caramel macchiato, upside down and with vanilla syrup (2 pumps for venti, 1.5 for grande, and 1 for tall) and cinnamon dolce syrup (2 pumps venti, 1.5 grande, and just one for tall). Cinnamon Dolce Latte with caramel syrup and chocolate mocha syrup. Top with whipped cream and molasses drizzle. You can have it either hot or iced. It tastes like a spiced apple cider. Its basically a chai infusion in apple juice. You can also try it with caramel drizzle and whipped cream on top. The sizes that the “normal menu” gives you are “Tall,” “Grande” and “Venti,” (and now “Trenta” (Extra Big), but if you say you want the “short” size of any Starbucks drink you can get a less expensive and smaller sized drink. The short size is in their cash register, butv they don’t put it on the menu. Order an Iced Americano with no water and half ice and then add the half-and-half available at the milk and sugar table yourself. Its cheaper. Avoid eye contact with a barista, when doing so. Order a frappuccino while frantically screaming at your kids through your iphone, or simply after pretending not to hear the baristas questions, while browsing something terribly important. Make sure to let the Barista wait for a few seconds before responding. Video: People respond to Starbucks Secret Menu Drinks. Get a few ideas for the next time you order a coffee. How to order from the secret menu at Starbucks? How to order from Starbucks’ Hidden Menu. The Starbucks homepage can be seen here. If you know of a great Starbucks Secret Menu drink, then please add it with the recipe in the comment section below. Italian Soda! Buy sparkling water from the cooler, have them fill a large cup with ice, pour in the sparkling water, and add your favorite syrup flavor. If calories are no obstacle, have them mix in half and half and put whipped cream on top. Expect to pay for the sparkling water and the cost of “extra syrup”. It’s fantastic!